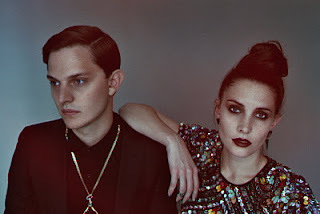 Night-pop duo Alpines follow up their March collaborative single 'Gold' (produced by Craze + Hoax) with new single, 'Empire', out next week. It's quite possibly the first track that will definitely feature on their as-yet-unannounced debut record - or at least we hope so. Listen to the track below. We first posted a demo of 'Empire' back in November 2010, the second (and only other) Hype Machine listed blog after Breaking More Waves to post the track and write about the band. Since then, the band signed to Polydor and delivered their debut EP, along with a clutch of singles. The latest effort, 'Empire', carries the same rousing sentiment of previous offerings, such as 'Ice & Arrows' and 'Drive'. Catherine Pockson's piercing vocals once again take centre stage, and rightly so, among the epic instrumentation and soaring backing vocals. A gloriously confident concoction. 'Empire' is released June 11th. Find more info at Facebook.